In this Sunday, Feb. 3, 2019, file photograph, a long row of unsold 2019 Cruze sedans sits at a Chevrolet dealership in Littleton, Colo.
A glut of unsold cars sitting on dealer lots, penalties for Fiat Chrysler, reimbursements for a tacky wedding and more await you in The Morning Shift for Friday, Feb. 8, 2019. Yes, yes auto sales were strong last year in the U.S. But like all markets, what goes up must also come down. The easiest place to look for evidence? Probably the number of cars sitting, unsold, on dealer lots. 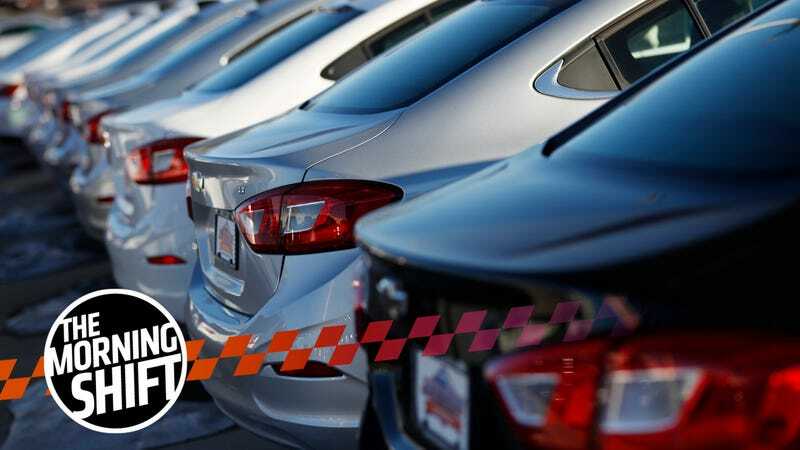 Dealerships are kicking off 2019 with a lot more unsold cars on their lots, which could result in pressure back towards automakers to reduce factory output, according to the Wall Street Journal. We’ll see if sales figures can keep up with projected falling demand. Stricter emissions regulations put in place during the Obama Administration challenge automakers to build cars that are better and more efficient. This is a good thing for the environment, but sometimes not the easiest to pull off for companies like Fiat Chrysler. Meanwhile, FCA also killed off cars like the Chrysler 200 and the Dodge Dart. You know, cars that are actually small. It kind of feels like FCA brought these fines upon itself. Yesterday, we published a report that alleged that Renault, under Carlos Ghosn, contributed about $57,000 “under a charitable donation agreement signed with the Château de Versailles” which possibly went toward his Marie Antoinette-themed wedding. That money is now getting reimbursed. While there is much to speculate on here, I’m just stuck on the Marie Antoinette-themed wedding. Because it sounds really effing tacky. And, oh God, when you see the photos... yeah, it was super tacky. I would have spent $57,000 elsewhere. But that’s none of my business. Last year, Donald Trump likened the effects of import cars and car parts on the American domestic economy to a threat on “America’s national security” in order to justify trade restrictions. These are big, scary words that are extremely worthy of an authority-check. In short, members of Congress want to check Trump’s authority to use “national security” as a means of justifying his tariffs, according to Automotive News. The U.S. Chamber of Commerce, Business Roundtable and dozens of other trade associations have stepped up efforts to derail Trump’s attempts to impose duties on light vehicles and other goods. Abuse of power? Trump? No way. Just this past Tuesday, we reported that Ford is laying off over 1,000 employees at its Flat Rock Assembly Plant but “all full-time workers will be offered jobs at other plants, with about half being transferred to the Livonia Transmission Plant.” Now it seems like Chicago is getting the love. Ford said yesterday that it’s putting over $1 billion toward its Chicago operations, which will result in 500 new jobs, reports Reuters. This, apparently, is all in preparation for the three new SUVs it plans to launch this year. Yes, because if you’ll kindly recall, Ford announced last year that it will phase out all of its small cars and sedans in North America. The trucks, SUVs and Mustang are sticking around, though. We’ll always have the Mustang.